Oh yes, it’s that time again! We’ve tripped out to sunny Florida for a week of sweeping beaches, fruity cocktails and non-stop dancing until the early hours. First up, we’re off to our DJ Mag pool party at The Surfcomber Hotel, an annual bash we throw every March for our stateside DJ Mag readers. We’re here to celebrate Miami Music Week — an annual dance music conference that sets up shop in Miami each year — with the waterside hotel famously kitted out with DJ Mag branded beach balls that float atop a crystal clear swimming pool in the centre of the party. 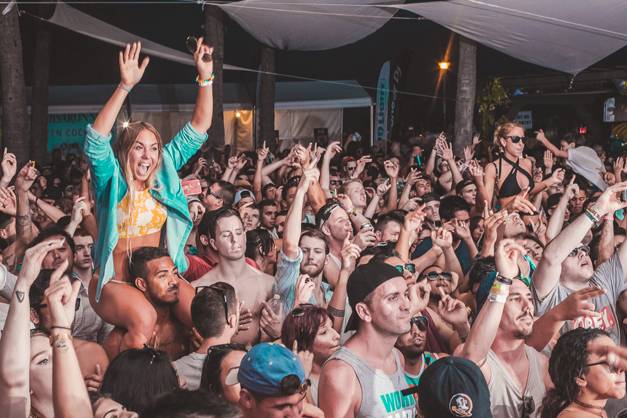 It’s not the first time DJ Mag has thrown its famed MMW knees-up at The Surfcomber, with past events featuring acts including MK, Kevin Saunderson and Bob Sinclar. Last year’s event was one of our biggest yet, with Patrick Topping, Dyro and Hardwell all spinning, as well as Seth Troxler, who famously dropped Phats and Small’s stone-cold classic ‘Turn Around’. 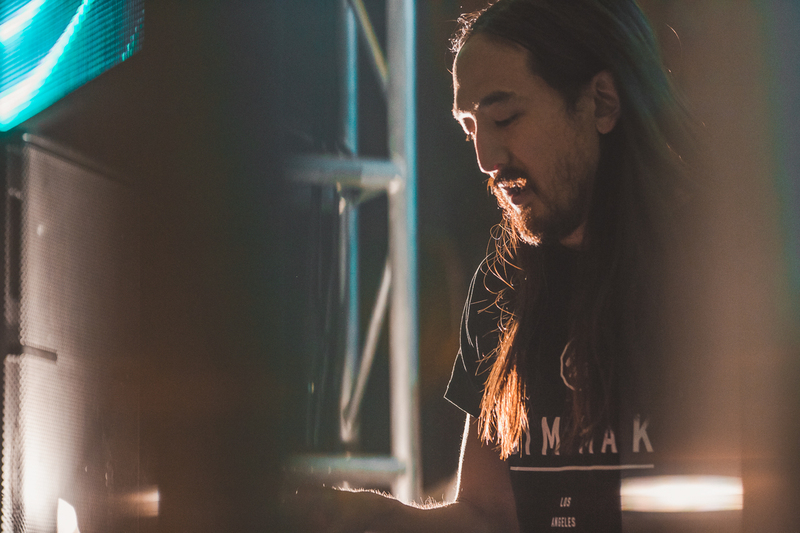 This year, the line-up is even more impressive — everyone from Steve Aoki to Dubfire are set to spin over the course of the day. As we arrive at The Surfcomber on Wednesday morning there’s already an enormous queue building at the front of the famous South Beach hotel. The strip is bustling with tourists and the odd local too, as hip-hop and EDM blares from cars parked on the curb. Once inside, Toolroom-signed star Weiss is warming things up nicely — it’s his usual blend of Chicago-inspired house and chunky tech rhythms. UK duo Eli & Fur are next to spin, followed by Defected homeboy Sonny Fodera, before we all head up to the Pioneer lounge for a quick spin on some of the tech brand’s new kit. UK DJ legend Paul Oakenfold also stops by for a chat, as does Parisian selector D’Julz, before we head back downstairs in time for Josh Wink followed by Nick Curly. Next up, our unannounced guest is on the decks — it’s none other than much-loved DJ/producer Dubfire, who is also our DJ Mag USA cover star this month. Dubfire slams down a set of rough and ready techno much to the crowd’s delight, splicing his tracks with buzzing reverb and complex FX. EDM star R3hab is tasked with taking us into the evening, hopping on the mic as soon as he starts his set. From there it’s EDM madness all the way until close, with Canadian duo DVBBS sending the crazy crowd into hysterics as the sun sets over the picturesque beach behind us. Steve Aoki’s fans are out in force as the long-standing star takes the decks, with the crowd chanting his name whilst he cycles through Dim Mak classics and a few new jams. Aoki even drops a wacky, EDM remix of the Lion King theme just before closing out his set, leaving Top 100 DJs winners Dimitri Vegas and Like Mike to take the crowd home. As the clock strikes 11pm and the music fades, we walk back along the beachfront taking a quick pit stop for a greasy kebab. A rapid, much-needed freshen up at our hotel and we’re off down Collins Avenue to local hot spot, Treehouse. The South Beach venue has become a staple of WMC in recent years, entertaining showcases for Get Physical, Carl Craig’s Planet E and Life + Death in recent years. Its two intimate rooms stylishly dressed up with quirky decorations, as chosen by much-loved UK DJ duo, Dusky. 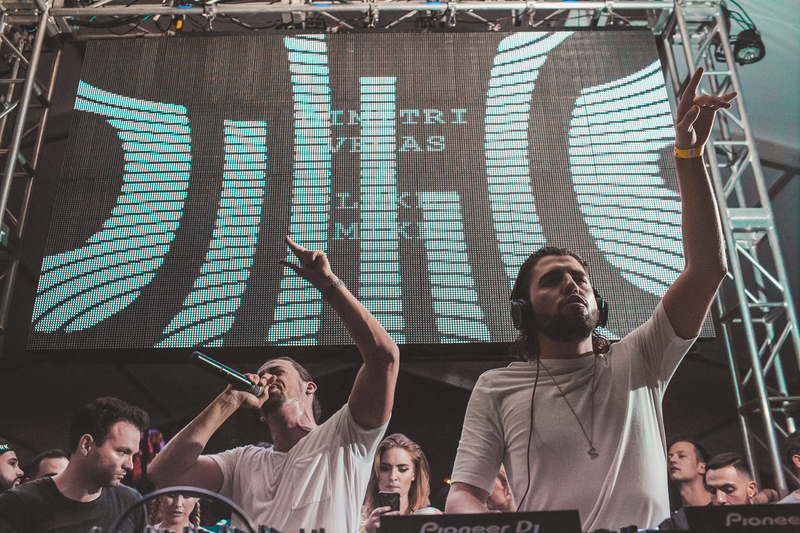 They’re here heading up their annual Dusky Presents… party, which they throw every year in time for Miami Music Week. Last year saw Agoria, Danny Daze, Skream and Murk all spin for the duo, whilst this year The Black Madonna and Jackmaster are on board. As we arrive Dusky are banging out their usual brand of classy, throbbing techno, as the dancefloor quickly swells almost to bursting point. A spin of their classic track ‘Carless’ is a high point, before we squeeze out of a side door and into room two. Jackmaster and The Black Madonna are going back-to-back inside, whilst Jackathon boss Heidi dances beside the decks. It’s an insane selection of non-stop stompers from the talented duo, before rounding off the evening with a final half hour of classic disco cuts. A shirtless Jackmaster starts a conga line on the dancefloor just as the lights come on whilst the last remaining beats sadly drain from the speakers. As day two dawns we’re feeling a tad fragile; alas there’s no time for rest in Miami! After meetings and a few frantic emails, we spend the early evening at Soho Beach House to celebrate the launch of new networking app, Crowdmix. We manage to take a few snaps of the glittering sunset from the hotel’s magnificent rooftop before heading off for some pre-party sushi and a cocktail (or seven!). Next up, it’s time for Richie Hawtin’s event at swanky hotel South Beach hotel, The Edition. The party’s line-up is pretty impressive even by Miami Music Week standards — The Martinez Brothers and Loco Dice are both set to play followed by a special back-to-back from Chris Liebing and Richie himself. The small club is close to capacity by 11pm but we get to sneak in through a secret backdoor and up beside the booth. We spend the evening sipping on Richie Hawtin’s famous brand of Sake (it’s tasty!) as the who’s who of techno stream in and out of the booth. A spin of Hearttrob’s ‘Never Wanted One’ by The Martinez Brothers sends the dancefloor into overdrive, whilst Hawtin and Liebing’s back-to-back is one of the best we’ve seen in years. As the sun slowly rises outside at a blistering 6am we decide it’s time to leave — this is only a warm-up for the weekend. With Elrow, Get Lost, Last Resort and Ultra all on the cards for the next few days, it’s going to be a rave marathon of epic proportions. Stay tuned! Check out pics from the DJ Mag party at The Surfcomber here.